Fiber-conscious consumers often assume wheat bread is a healthier choice than white, but that's not always true: Some breads labeled wheat are actually nothing more than white bread with food coloring added. On The Saturday Early Show, Dr. Mallika Marshall explained which options in the bread aisle are the most nutritious. Marshall notes that, with the popularity of low-carb diets, many people are avoiding bread altogether. But she says that's not a good idea. 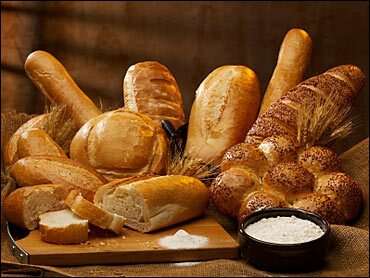 Your body needs carbohydrates to function, and one of the places you find carbs is in products such as bread. But not all carbohydrates are created equal. You want to eat complex carbohydrates, which are found in foods such as whole grain breads and cereals. White bread, she continues, isn't the best choice because that means they took out the good stuff: They just left the starchy part of the grain, then they threw back in a couple B-vitamins and some iron. Also, there's little or no fiber, which you need for good digestive health, and for helping ward off heart disease and some cancers. Still, Marshall cautions, don't just "go brown" with your bread: Not all brown breads are created equal. Breads that look brown aren't necessarily good for you. It may simply have caramel coloring. What you want to see on the label is the term "whole wheat" or "whole grain," and you want that to be the first or second ingredient on the list. Other words to look out for are "whole mill," "whole barley," or "whole oats." Whole grains have been shown to lower cholesterol and supply vitamins and antioxidants that may help the heart. In fact, a recent study showed that people who eat two-and-a-half servings a day of whole grains are about one-fifth less likely to have heart disease than those who pass on whole grains. Rye and pumpernickel breads are others many people think are good for them but that may not necessarily be, Marshall points out. They can have refined grains in them, too, so don't be deceived by the color. Again, you have to look at the label. Another bit of advice: Don't be fooled by freshly-baked white and some other breads, whose aromas waft through stores and are quite appealing. It's not that those breads are unhealthy, but there are healthier choices available, so if there's no real difference in taste, why not go for a bread that has whole grains, which decrease the risk of heart disease, cancer, stroke, and diabetes? According to the American Dietetic Association, a healthy adult should be taking in between 20 and 35 grams of fiber per day. Unfortunately, most Americans only get about 15 grams of fiber a day. So when you're in the grocery store aisle, look for breads that have the highest fiber content. You wouldn't think that bread has a lot of sodium in it, but sodium is used as a preservative in many breads. So make sure there are 350 milligrams or less per serving. These are the worst kind of fats for you, so if you see either of these on the label, DON'T buy it.